Labels! Labels! Wherefore art thou labels!? Home > Blog > Labels! Labels! Wherefore art thou labels!? For the third installment of our four-part series to share packing techniques for a successful summer camp experience, I’m sharing labeling tips! 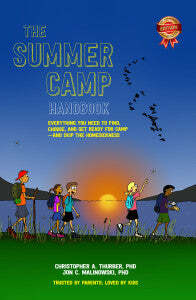 Get words of the wise, borrowed from ‘The Summer Camp Handbook,’ the comprehensive guidebook written by camp experts, Dr. Chris Thurber and Dr. Jon Malinowski. I’m only going to say this once so I’ll shout it: LABEL EVERYTHING!!! It’s easy to lose things at camp, but, if you want it back, it’s got to have your name on it! Campgrounds that get a lot of action such as the waterfront or athletic fields can be messes after campers have had their fun. Towels, shirts, socks, shoes, and gear will all be strewn across the landscape. And in this chaos, kids forget. That towel left by the docks will get trampled and rained on before someone (maybe) puts it in the lost-and-found. There, it will begin to mildew and take on a foul odor. A labeled towel, however, may find its way back to its owner before meeting such a fate. That’s why it’s smart to label everything. Did I already say that? Label your child’s water bottle, sunglasses, sports gear, hats, shoes—everything! Label it all! Label everything. 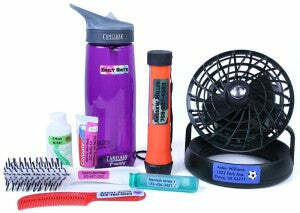 And, though theft is typically a nonissue and summer camp, labeling reduces the chance of an item being stolen. Don’t just stop at clothes. Label EVERYTHING! We offer a handful of options for labeling: Iron-On Clothing Name Labels, Stick-On Waterproof Name Labels, Clothing Stamps, and Laundry Markers. None of these methods are perfect, but some are easier to use than others. Most families combine methods to suit their needs. 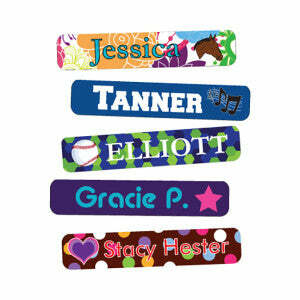 These labels are strips of fabric with your child’s name printed on them. We recommend our Iron-On Name Labels for shirts, shorts, and pants, but not for socks. Use a Laundry Marker or stamp for socks. The average camper needs more than 60 different items of clothing for their camp stay, so ironing is typically a quicker route than labeling by hand. These waterproof beauties are as simple as they sound. Just peel and stick. Perfect to tag onto your toothbrush, flashlight, sunscreen, battery-operated fan, and so much more, these are a great way to make sure your stuff makes its way back to you. Label everything! Our rubber sta mps print your child’s name nice and clearly. We recommend when you order with us to use both first and last names—or, at least, first initial and last name. Otherwise, two children with the same last name might get their stuff mixed up. These stamps are made to work well on clothing. Stamp shirts inside the collar, pants and underwear inside the waistband. 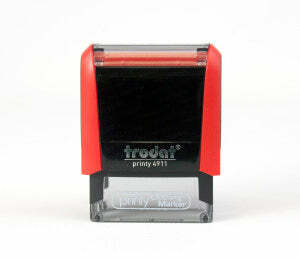 You can use these Markers to label anything from clothing to shoes (just pull down the tongue and mark the inside tag). Laundry Markers also work great on plastic, metal, wood—just about everything. Laundry Markers are quick and easy to use, but they can fade and distort with repeated washing or use. It’s smart to pack a second Laundry Marker for re-labeling at camp. Re-label everything. You can get even more labeling tips when you order your own copy of ‘The Summer Camp Handbook’. Tune in next Monday to get great tips about the literal packing for camp and, as always, thanks for reading.